A little bit spicy...a little bit sweet. It's the perfect definition of me and my husband. I'm totally spicy...he's totally sweet. No wonder this dish is one of our favorites. 1. Heat oven to 350 degrees, spray 9x13 pan glass baking dish with cooking spray. 2. In a nonstick skillet, heat oil over medium/high heat. Add chicken, lime juice, salt & pepper; and cook until juices run clear. Add onion and red bell pepper cook 4 to 5 minutes until softened. Stir in pineapple, beans, and green chilies. Cook and stir until thoroughly heated. 3. Remove from Heat, stir in cilantro and mozzarella cheese. 4. Spoon and spread 1 tablespoon enchilada sauce onto each tortilla. Spoon about ¾ cup filling mixture over sauce on each. Roll up tortillas; place seam side down in baking dish. 5. 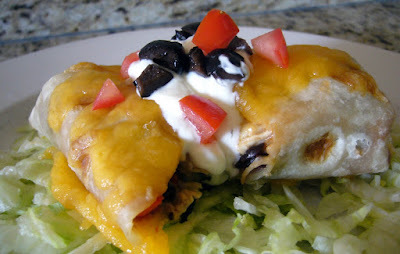 Pour remaining enchilada sauce over center of enchiladas and sprinkle with cheddar cheese. 6. Bake at 350 degrees for 30-40 minutes until cheese is melted and enchiladas are bubbly. *Time saver suggestion: When ever I make these, I will double the recipe. I'll make half just as outlined above. The other half I roll up individually, place on a cookie sheet and freeze. Once frozen I place them in a freezer bag for later use. I can then do one of two things. One option; I can pull out several of them and place in a baking dish, top with enchilada sauce and cheese, then cook for another meal when I'm low on time. Second option; I can pull one out at a time for a fast and easy lunch or quick dinner. My husband often takes them to work for lunch. They taste so much better than those grocery store frozen burrito’s, and I'm sure they're a lot healthier. These sound amazing! I can't wait to try them out. I just discovered the uncooked tortillas and I love them so much. I will never buy regular ones' again.